Christmas can be really depressing. Don’t get me wrong – I love all the decorations and the food and everything, but it’s so damn expensive. Even if you don’t have a lot of people to buy presents for, those you do have to get can really add up. On top of the expense, there’s always the feeling that most of the things you buy are unnecessary and perhaps even unwanted, too. How many of us can honestly say we’ve never received a Christmas present we didn’t want? Come on, be honest. We all have. Each and every one of us has, at some time or other in our lives, received something hideous and groaned at its inappropriateness. But did we stop to think that the present had cost someone money? That perhaps the giver had agonised over whether or not it was the right gift? 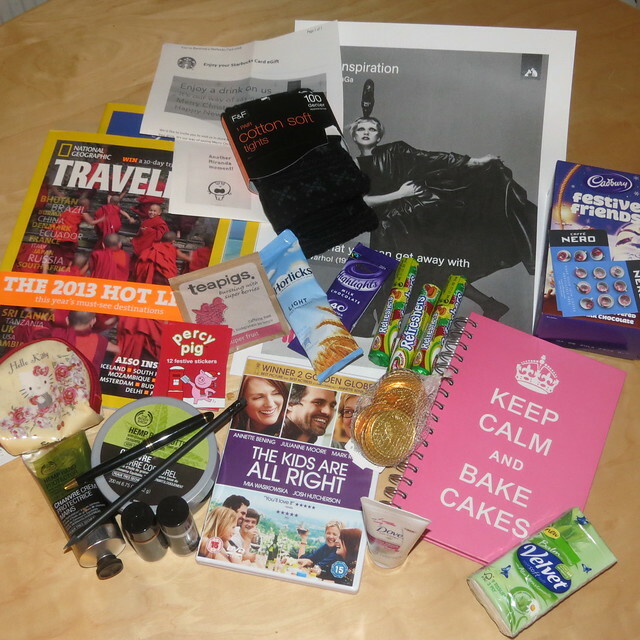 A magazine, tea, hot chocolate, free coffees, a notebook, pen & pencil, chocolate biscuits, sweets, hand cream, shower gel, a DVD, a Hello Kitty purse… ALL FREE! Not only did we both have a lot of fun collecting things and rising to the challenge, all of the usual pressure was off. There was no concern over one person having spent more than the other, just a fight to see who could collect the most. There was some thought (some of my presents are really cool! ), but there was also some silliness (but really, who doesn’t love free tissues?). I didn’t receive a single thing I didn’t like or couldn’t use, and even found joy in the surprise of opening things. I’ve mentioned Freebie Christmas to a few people and everyone I’ve spoken to seems to think it’s a good idea. It’s amazing how much good stuff you can get for free (just see above! ), and think of how much stress and money you could save yourself if you agree to a Freebie Christmas next year.